Echoing the color of the wildest natural stones, this tone will definitely break with the monotony of your home, without ceasing to be a great basic. A soft cream surface in the purest Renaissance style. For lovers of the classic, Irok gives off light and serenity. ... special materials and aggregates of different type, shape, color and nature: from the granite to porphyry, from marbles to stones. And with liquid or mechanical processes. 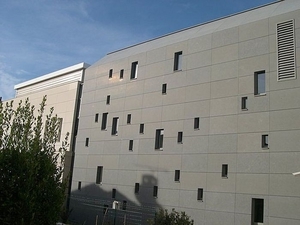 This cladding is used to improve building envelope appearance and protect the structure from weather damage. It is attached to the load-bearing structure, sometimes with an air gap between the two for thermal insulation and humidity control. It is found on a range of public, private and commercial structures. Cladding choice will depend on cost and ease of installation, compatibility with its environment and compliance with applicable building codes. The installation method must not compromise thermal insulation, watertightness or structural integrity. Other factors include resistance to diverse weather conditions, ease of repair or replacement in case of damage, maintenance requirements and whether the cladding is color-fast or prone to fading.